A lush vegan restaurant, that is known among the locals and travellers alike for its one-of-a-kind menu, Bean Me Up offers the choicest of health food. The space also offers accommodation and a yoga space as well as hosts weekly music events by travelling musicians, and is housed within the compounds of a beautiful old Portuguese villa. The menu, hands down! Designed keeping in mind, the idealistic travelling nomad, the restaurant offers a selection of mouth-watering, organic, vegan dishes that are created using fresh, local ingredients and seasonal produce. Their Soya Station-Salad Bar offers a variety of vegetarian food, and a California style salad bar, which comes with its own choice of home-made sauces! The restaurant makes their own tofu and tempeh from scratch — two must-try items in the menu, besides being ingredients that you can buy separately to take back home with you. Additionally, we highly recommend their middle eastern platter — the baba ganoush is to die for! Brainchild of Shawn, who himself is a travelling chef with culinary experiences from across countries, Bean Me Up is a hotspot among conscious travellers. The cocktail bar serves delicious drinks with bamboo straws rather than plastic, taking a much-needed step towards eco-friendly living. At the restaurant, be sure to note the blackboard behind the bar titled ‘Bean of the Day’ — the chef’s special dish that features a new bean as the hero of the dish each day. We’d recommend going in a group so that you can get a taste of enough dishes, even if you’re not particularly vegan, because the food is delicious, the environment super chill and the staff superbly friendly and welcoming! 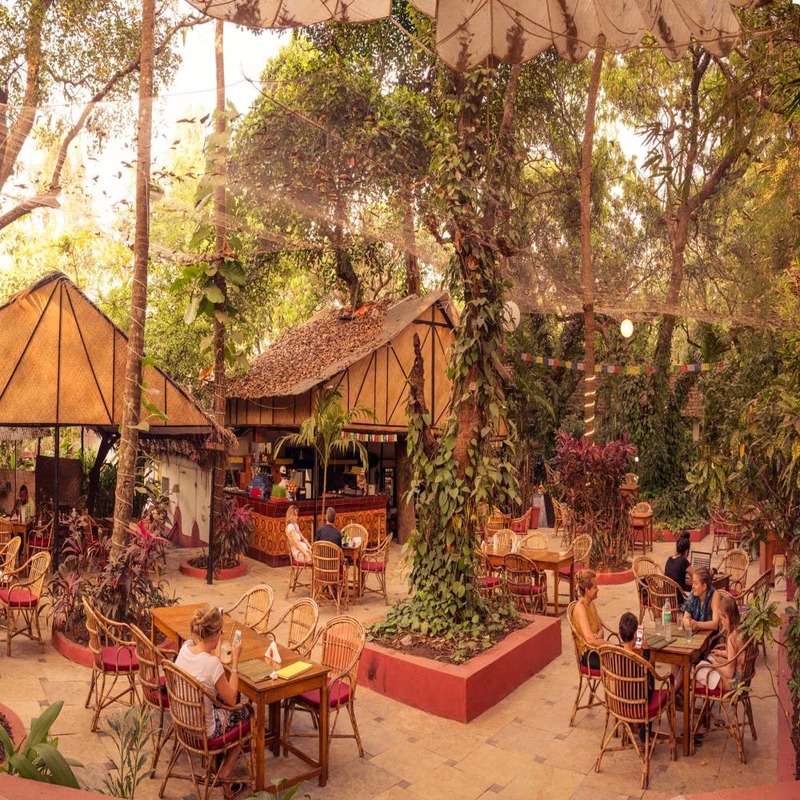 For those looking for a slow-travel experience in Goa, the restaurant is surrounded by simple garden-view rooms that are available at reasonable rates. Take your time with the menu — Shawn has carefully crafted the menu taking time to explain every new dish/ingredient used — so if you’ve never heard of tempeh or seitan, you’ll have ample opportunity to really know what you’re eating.